Woke up Saturday morning feeling some excitement. My flight from Portland, Oregon to Spokane, Washington was essentially a fairly routine one. While I have never flown that sector before, I have been to both airports and both cities a few times now. Yet Southwest Airlines flight 3218 was no ordinary flight for me. It was the 737th flight in my life. Yup, I have left the ground 737 times -and returned 737 times. I have fastened my seatbelt 737 times. Thanks to Southwest airlines being an airline who (currently) only fly Boeing 737s, my 737th flight would be on a Boeing 737. For a plane geek, thats the ultimate in geekiness! I checked in online and was assigned position B5. Southwest do not assign seats. Instead you get allocated a position in the boarding line based on essentially the time you check in. You then board in 3 groups of 60: Group A, Group B and Group C. My position meant I would board as the fifth person in the second group. Once on board, you are then free to choose your own seat. The earlier you board, the better your chances of bagging a good seat. In my case, there would be at least 65 people ahead of me. Our plane was N744SW pictured here at Spokane. This 737-700 first flew for Southwest on 26th March, 1999 and has 137 economy seats. I was surprised to easily get 11D, an aisle seat in the emergency exit row. While it does not have much more leg room, the seats in row 10 do not recline and there are only 2 people in the row. Friendly welcome from the on board Southwest team (as always). Contrast that to the usual grumpiness at United, the surliness of American and the cool aloofness at Virgin America. While it was a full flight, the luggage compartments did not end up being full. Southwest do not charge for checked in luggage which makes boarding less stressful compared to United, for example where people try to carry on board small mountains of luggage and fight over every inch of luggage space. We took off right on time and landed right on time. It was a very smooth flight with some light turbulence as we descended into Spokane airport. I shared with the crew 3/4 through the flight about how my “hobby” of recording my flights started. Just before his death, my friend Tony Chapman set up a Flight memory account into which he painstakingly entered 100s of my flights from my junior jet club book and frequent flyer statements). As soon as I told the crew that it was my 737th flight, they understood the significance and connection with this aircraft. On the ground, I was invited into the cockpit, met the captain and recorded these happy snaps. 6 out of 5 – Thanks Southwest for a memorable 737th flight – six stars today! 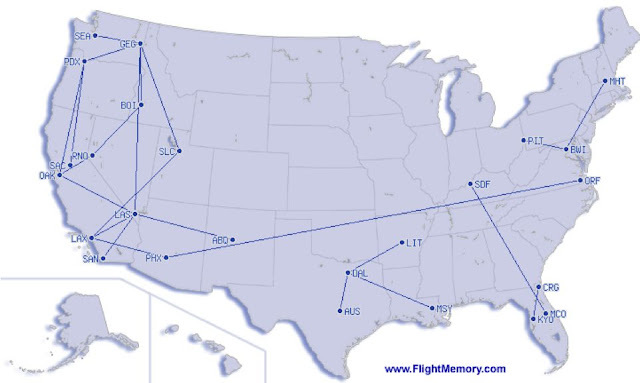 My average rating for all Southwest flights I have flown on over eleven years is 4.5 out of 5. Would I fly them again? Yup!